HEY LONG ISLAND GO TAKE A HIKE! 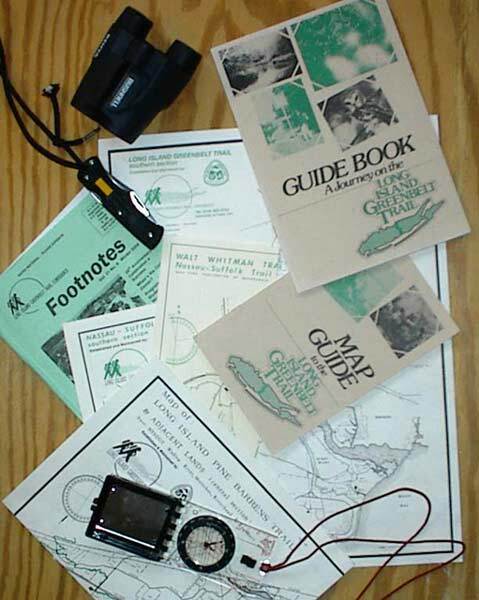 Trail maps are available through our internet store. You can also get them at the LIGTC office in the historic Blydenburgh – Weld house at Blydenburgh Suffolk County Park. Long Island Greenbelt Trail: Follow the courses of the Nissequogue and Connetquot rivers on all or part of a 32-mile adventure from Long Island Sound to Great South Bay. Bluffs and beaches, ponds and pines, history and diversity - this National Recreation Trail has it all. Pass through spectacular Sunken Meadow, Caleb Smith, Connetquot and Heckscher state parks, and traverse the Ronkonkoma Moraine - and stop in to visit us in our office at Blydenburgh County Park. Hikers have been enjoying this true cross-section of Long Island since 1978. Map two sides, two color, 13in by 17 in. Nassau-Suffolk Trail: From steep hills to old fields to quiet wetlands, this 20-mile National Recreation Trail offers surprising diversity. From Cold Spring Harbor, where mountain laurels bloom in June, the trail crosses Long Island to Massapequa Preserve watershed, where dozens of species of birds stop on their fall and spring migrations. Paths for mountain bikers parallel parts of this trail, and a loop in the Plainview area provides a connection with the Walt Whitman Trail. Map two sided, two color, 10in by 17 in. Walt Whitman Trail: Walk in the footsteps of the poet himself. A network of linear and loop trails begins at the historic Whitman Birthplace with a 0.6-mile road walk on West Hills and Reservoir Roads. A popular 3.7-mile loop begins near the top of Reservoir Road and winds through West Hills County Park. It is also accessible from the Sweet Hollow Road picnic area. Gaze as Whitman did on a view of the ocean from the top of Jayne's Hill, the highest spot on Long Island. The network connects with our Nassau-Suffolk Trail, making possible walks in many combinations of length and difficulty. West Hills is easily accessible from busy Route 110. Long Island Seashore Trail: New York State's only Federal Wilderness Area beckons visitors to the barrier island of Fire Island National Seashore. Drive to Smith Point in the "off season" or take the summer ferry from Patchogue. Dayhike or backpack amid beach plums, holly, pines and sassafras. (Trail is open but unblazed; follow National Seashore maps. Limited wilderness camping administered by F.I.N.S.) There is no LIGTC map for this trail. Pine Barrens Trail: Leave suburbia behind and experience the "other Long Island" by exploring the heart of the nation's second-largest pine barrens. The 47-mile route from Rocky Point to Hampton Bays traverses pristine woodlands and passes rare coastal plan ponds. Opened in 1994, the Pine Barrens Trail offers unusual flora and fauna, excellent vistas and wonderful aromas. Open all your senses and reap the rewards of a "walk on the wild side." Map Pine Barrens West, two color, 14in by 23in. Map Pine Barrens Central/East, two color, two sides, 17in by 23in.